Canine Choice Adult Medium is a complete grain-free dry food for medium-sized dogs between 11 and 25 kg. It has a high proportion of meat (60%). Medium-sized breeds are known for their energy and playful temperament, so they need food that provides them with plenty of energy and high-quality protein to maintain their muscles. 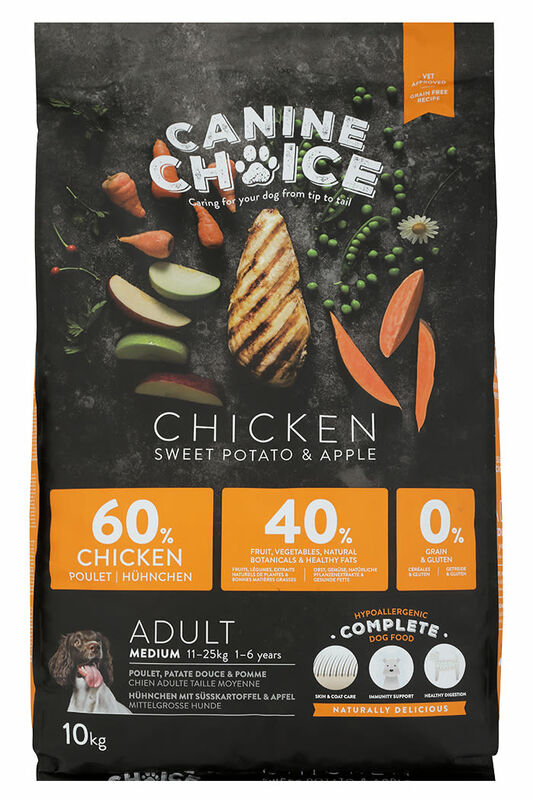 With Canine Choice that’s what’s on the menu: 60% chicken, salmon or lamb (mostly as fresh meat), plus sweet potatoes, which provide energy and dietary fibre. It also contains vegetables and natural plant compounds to support good health. 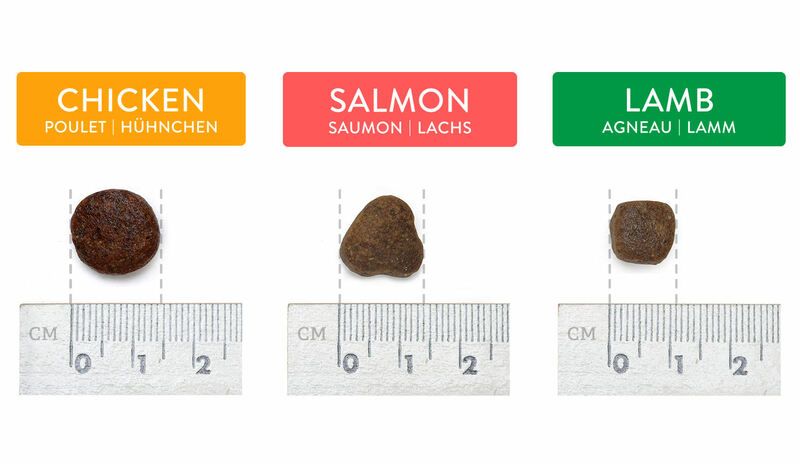 We care about what goes into your dog’s tum: Andrew and us on the Canine Choice team put loads of thought, care and expertise into the ingredients so they’re worth a read! Fresh chicken (38%), Dehydrated chicken (17.5%), Sweet potato (17%), Peas (7.5%), Apple pulp (5.5%), Hydrolyzed chicken liver (5%), Dehydrated carrot (0.32% equivalent to 3% carrots), Dehydrated cranberry (0.8% equivalent to 0.75% cranberries), Chicken fat, Brewer’s yeast, Fish oil, Minerals, Chicory (Source of FOS), Mannan-oligosaccharides (MOS), Camomile, Parsley, Rosehips, Sea algae, Rosemary, Cloves, Glucosamine (300 mg/kg), Cartilage (a source of Chondroitin 200 mg/kg), Yucca schidigera. Crude protein 28%, Crude oils and fats 17%, Crude ash 7%, Crude fibres 3.25%, Fatty acids (Omega 3) 3.2%, Calcium 1.40%, Phosphorus 1%, Fatty acids (Omega 3) 0.4%, Metabolizable energy 3850 kcal/kg. Vitamin A 19.000 IU/kg, Vitamin D3 1.700 IU/kg, Vitamin E 500 mg/kg, Vitamin C 250 mg/kg, Zinc (Zinc oxide) 108 mg/kg, Iron (Ferrous sulphate, monohydrate) 68 mg/kg, Copper (Cupric sulphate, pentahydrate) 9 mg/kg, Manganese (Manganous sulphate, monohydrate) 7 mg/kg, Iodine (Potassium iodide) 3.2 mg/kg, Selenium (sodium selenite) 0,11 mg/kg. Fresh salmon (38%), Dehydrated salmon (17%), Sweet potato (14%), Peas (10%), Hydrolyzed salmon (5%), Apple pulp (3%), Dehydrated carrots (0.32% equivalent to 3% of carrots), Dehydrated cranberries (0.08% equivalent to 0.75% of cranberries), Chicken fat, Pea protein, Brewer’s yeast, Minerals, Chicory (source of FOS), Mannan-oligosaccharides (MOS), Camomile, Parsley, Rosehips, Sea algae, Rosemary, Cloves, Glucosamine (300 mg/kg), Cartilage (a source of Chondroitin 200 mg/kg), Yucca schidigera. Crude protein 27%, Crude oils and fats 17%, Crude ash 7.25%, Crude fibres 3.25%, Fatty acids (Omega 3) 3.0%, Calcium 1.20%, Phosphorus 1.15%, Fatty acids (Omega 6) 1.0%, Metabolizable energy 3850 kcal/kg. 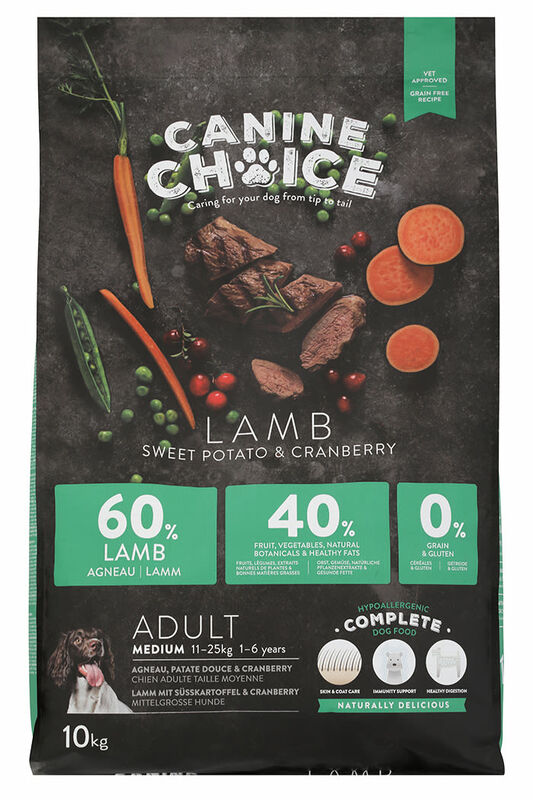 Fresh lamb (40%), Dehydrated lamb (15%), Sweet potato (13.5%), Peas (7%), Hydrolyzed lamb liver (5%), Apple pulp (5%), Dehydrated carrot (0.32% equivalent to 3% carrots), Dehydrated cranberry (0.08% equivalent to 0.75% cranberries),Chicken fat, Pea protein, Brewer’s yeast, Fish oil, Minerals, Chicory (Source of FOS), Mannan-oligosaccharides (MOS), Camomile, Parsley, Rosehips, Sea algae, Rosemary, Cloves, Glucosamine (300 mg/kg), Cartilage (a source of Chondroitin 200 mg/kg), Yucca schidigera. Crude protein 27%, Crude oils and fats 17%, Crude ash 7.5%, Crude fibres 3.25%, Fatty acids (Omega 6) 2.25%, Calcium 1.5%, Phosphorus 1%, Fatty acids (Omega 3) 0.36%, Metabolizable energy 3850 kcal/kg. If this is the first time you’re feeding your dog Canine Choice it’s easy to switch from their current food over the course of a few days. Start of by replacing 25% of their existing food with this one, then increase the amount of the new food by 25% every other day until they’ve fully made the switch. Always make sure your furry friend has accesss to plenty of water. Our Parsons Jack Russell, Saphie, has been on Canine Choice medium biscuits for 9 months now and can't get enough of them. She even likes them as treats! It's nice to know how good they are for her. 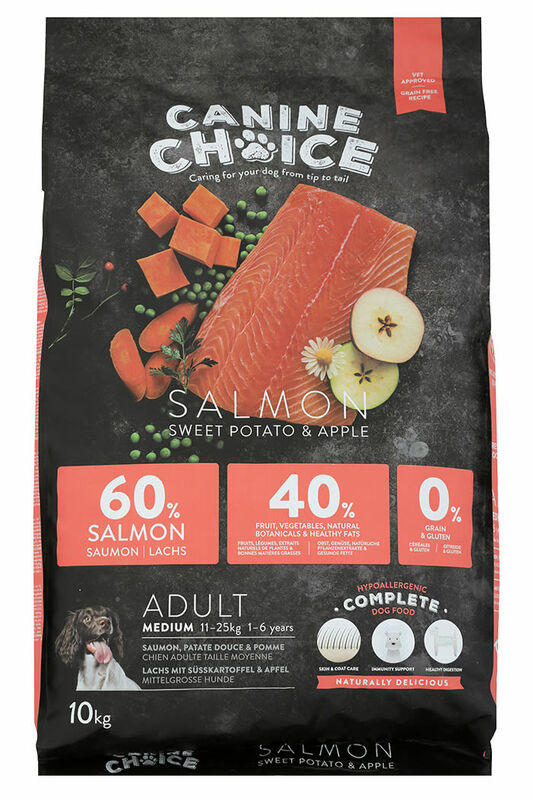 I have just ordered a 10kg bag of the salmon flavour as well as her normal chicken flavour. A brilliant product! The food looked and smelled ok to me but we were trying to change from Canagon which is also a 60/40 % high quality food . 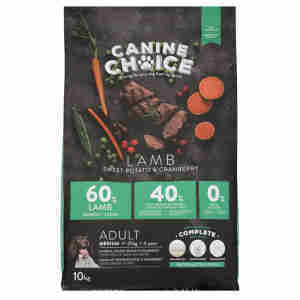 We had decided to try canine choice as the price was much more competitive than our usual Canagon food.We followed the new food introduction guide, and even took more days to introduce the new food slowly, at 25% of canine choice my dog was ok, at 50% canine choice my dog wasn’t as keen to eat and developed an extremely loose tummy and at 75% of canine choice my dog became extremely unwell and wouldn’t get up out of his bed. My dog is a very sensitive boy and also suffers from epilepsy. At 75% of the canine choice he looked so unwell and very much like he was going to have a seizure so we stopped and reverted back to his Canagon food. His appetite quickly returned and his tummy issue was solved. This food just didn’t suit my dog but he is extremely sensitive. The only positive was that his coat was soft and a little more shiny than normal. See the difference in condition!! My dog loves the Salmon variety. She is a fussy eater so great to find something she likes that is also super healthy. I appreciate the regular discount offers given by Pet Supermarket as this is normally out of my monthly price range. and they have a sensible free delivery threshold of £19. thank you. I am trying the salmon this time, my dog loved the chicken, she also loves the salmon, I will try the lamb next.